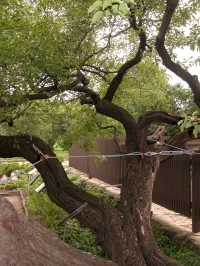 The tree most notable for its ability to survive after a serious accident must certainly be the European buckthorn (Rhamnus cathartica) in the Medicinal Plant Garden. This tall shrub arrived at the Garden in 1939, and has always had a very open crown, shaped like an inverted pyramid. Unfortunately, that feature makes it extremely vulnerable to severe weather. Following the major ice storm some years ago, that's exactly what happened. The poor buckthorn was completely crushed, like a flattened inverted pyramid, with its large branches lying on the ground. We weren't sure whether to get rid of it or keep it. In the end, we decided to do what we could with steel bolts, turnbuckles, rods and guy lines. Some experts accused us of taking "heroic measures", an affront to the tree's integrity. And indeed, once all the work was done, the buckthorn did look like some sort of puppet hanging by its strings. But it came back to life and, ten years later, it must be said that it is doing pretty well, even with all the screws. Last fall, a violent windstorm brought a huge ash tree crashing down right next to it, just a few centimetres from the poor buckthorn. I could have sworn the little devil winked at me as if to say "You won’t get me that easily!" In 2006, the Botanical Garden was given a facelift to mark its 75th anniversary. The main entrance was redone and the statue of Brother Marie-Victorin was erected there. Unfortunately, this meant that a few trees had to be removed – a decision made with many misgivings. 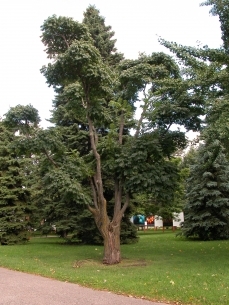 There was much discussion about the fate of a Lavallee's cork tree (Phellodendron lavallei), an uncommon species in these climes. Cork trees, native to the temperate regions of China, belong to the Rutaceae family – the same as orange trees! This particular cork tree, planted in the Botanical Garden in 1963, stands slightly over 8 metres high, just about its maximum height. Since we believed that the renovations were sure to damage the tree, we decided to replant it elsewhere in the Garden. We did everything according to the rules, including taking hours to dig out an enormous ball of earth so as to minimize any damage to the roots. 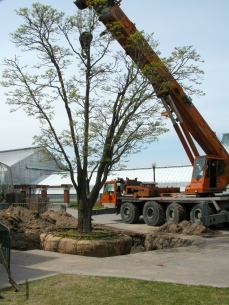 The tree was uprooted and moved with the utmost care on May 5, 2006, to great applause by everyone who had gathered to witness the event. It was relocated just a little way away on the front parterre, to the left of the administration building. Fortunately, that summer was very rainy, and that may have eased the shock for it. Our cork tree seems to have recovered from the trauma and adapted well to its new site. It was still thriving in the summer of 2009. Written by Michel Labrecque, curator at the Montréal Botanical Garden.